To get a quick perspective on the global risk concerns of major corporations across different industries, I've included some key points and images from the research documents. This will give you a general understanding of the risk climate which can help you have more informed conversations within your organization. Although the findings of the research documents were published in 2015, most risks are also projections for the next few years, so still pertinent to consider for your 2016 governance work. We encourage everyone to read these reports. 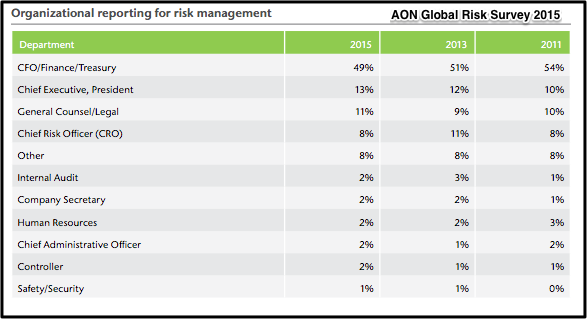 AON's research spanned across many industries, and has very interesting information on risks by industry and by region. 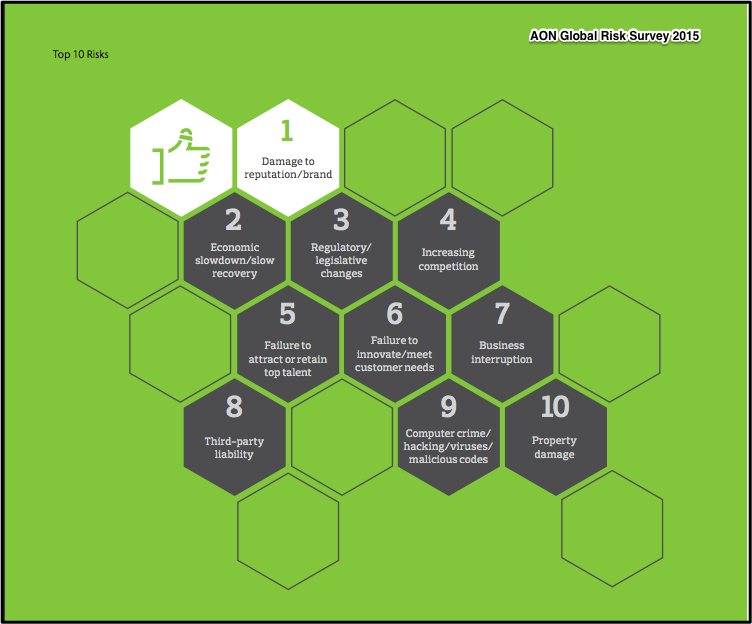 The first image highlights the top 10 risk concerns of global companies. Damage to reputation/brand is #1 and technology crime/hacks is #9. Websites and social media accounts can be a main point of entry to trigger both of these top threats. Take a look at your industry and see how, in general, the industry feels ready to jump into action should a risk event occur. How can you improve your web and social media risk management plan to address a risk event quickly and mitigate any damage to your corporate reputation and brand? 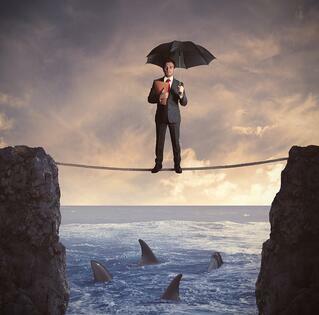 In most companies, the CFO is the key risk officer. Who is on the risk leadership team at your company? Understand their priorities and begin working on how you can help make a difference in their overall corporate risk mitigation plans. The tagline of this report says a lot — Operating in the New Normal: Increased Regulation and Heightened Expectations. Deloitte's research focused on the financial sector and highlights specific financial risks. The survey findings are based on the responses of 71 financial institutions from around the world and across multiple sectors, representing a total of almost US$18 trillion in aggregate assets. Due to the fact that this sector is heavily regulated (in most countries) it is not surprising that risk events due to regulatory compliance is a top threat. Because of this, there appears to be a wider adoption of the titled role Chief Risk Officer (CRO) than in other industries (signaling the importance of "risk management" as a major corporate priority). 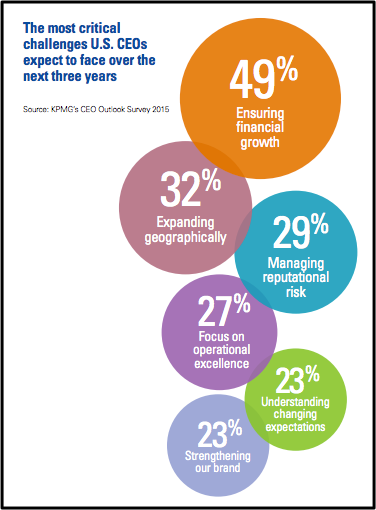 The KPMG Survey included 400 US CEOs and 800 chief executives from Europe and Asia. The image below is a quick look at the most critical challenges and risks that US CEOs are concerned about for the next three years. Reputation risk and brand strengthening are two of the six top concerns. 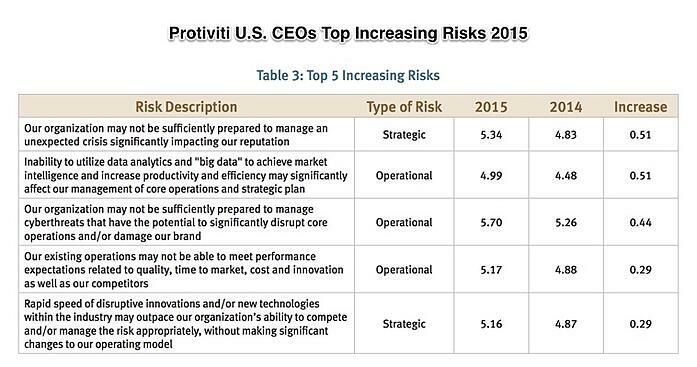 Protiviti: Executive Perspective on Top Risks for 2015. Protiviti's and NC State Poole College of Management's research was conducted at the end of 2014 and published in 2015. The findings were derived from interviews with 275 global executives across several industries. This report is very interesting with a lot of quick reference graphs. Of great interest is that they segmented risks into categories: macroeconomic, strategic, and operational. 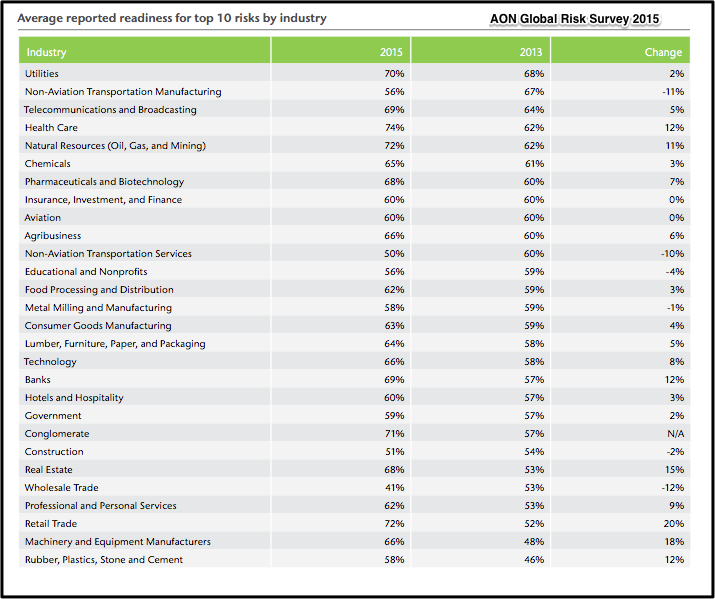 Below is a look at the top five increasing risks that US CEOs reported. Concern about reputation impact once again tops the list. The entire report is filled with in-depth information and worth a read if you are interested in diving deeper into understanding the executive mindset around risk assessment. This is the perfect time to review independent research on C-Suite risk concerns and begin to prepare your strategy to update your web presence governance program (including websites, blogs, and social media governance plans). The first step is to gather all of your 2015 web presence and social media governance documents and assess which elements of the plan worked well for the company's risk management strategy for 2015 and which did not. The second step is to gather information about your C-Suite's risk mitigation plan for 2016. Our next post will focus on the Social Media Governance Plan. Then we will address conducting a strong social media audit. To get a head start, you may want to review earlier Brandle posts. Brandle's mission is to help enterprises manage risks that arise from websites and social media, and research findings help us understand what is top-of-mind for our customers. This allows us to provide the strongest risk mitigation GRC Tools (and social media monitoring tools) you need to protect your digital brand across your entire web presence.